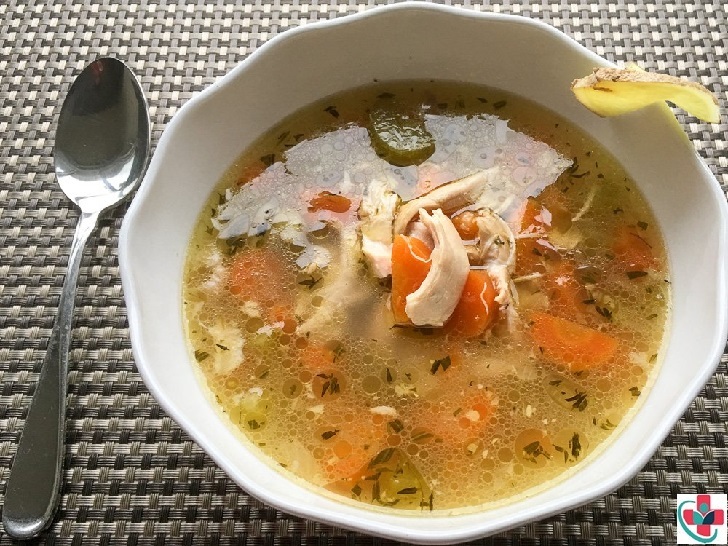 Since we discussed here the benefits of soup to the diet, the following chicken soup recipe is an ideal option during flu season, having a cold, or just desiring something warm and delicious. You may be wondering, where are the noodles? Well, I don’t add pasta to my chicken soup as we over-consume it. I feel it’s not necessary to add empty carb calories when you really won’t miss the noodles in this delicious soup. When it comes to super-foods that heal, I keep the calories nutrient rich. Sufficient calories in this soup rendered from fat found within the chicken bones and skin. But, these fat rich calories are justified by all the nutrients (essential fatty acids) you get as a result. Pasta often lacks nutrient-rich calories and therefore, not necessary when the purpose of food is to heal your body. ⤷Wash and pat dry chicken. In a heavy bottom pan, heat oil and chicken pieces. Remove chicken onto a separate plate. If some of the skin gets stuck to the bottom of the pan, not to worry, scrape it with a wooden spatula (you can discard it or leave it in for more flavor). To the same pot, add in all the small diced onion, ¹/₂ of diced celery, ¹/₂ of diced carrots – (save the rest for later) – ginger, garlic, and herbs. Sauté for 2-3 minutes. Add back the chicken pieces, in between or under the vegetable mix. Add enough water to fully cover the chicken pieces, plus 1 more inch. Once the pot comes to a boil, lower the heat, cover and let simmer for 15-20 minutes. Add in rest of the vegetables and if needed more water – stir, cover for another 30 minutes. Cook until chicken is cooked through and vegetables are tender but not soft. Taste, add salt and pepper as needed. I personally don’t add salt only some (1 tsp) black pepper. Remove pot from heat. Take out chicken pieces from the pot using tongs. Rest the chicken on a plate to cool slightly. When the temperature is OK to handle, use fork and knife to remove the chicken from the bone and skin. Cut into bite size pieces and add only the meat back to the soup pot, discard the bones and skin. Mix and enjoy. Extra can be frozen but better yet, share some with friends. And, feel better soon.